I finally got around to sending out Oscar's birth announcement. I decided to keep it super simple, and also made it into a postcard to save time, money, and trees. The back just has his birth date and stats. And here's the little guy all smiley and happy. He's growing so fast, I'm trying to make sure I take pictures of him in some of my favorite outfits before he outgrows them all! 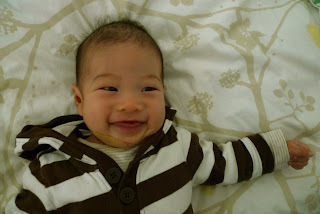 When we talk to him now, he'll crack a huge smile and try to mimic our mouth movements and will often coo in response. He's so fun. oscar!! why are you so cute?? look at him. totally adorable. he's adorable, so naturally- the save the date with him on it is too! it's so nice to see another photo of oscar - keep taking pictures! he's so cute! wow can't believe you caught that expression! hehee ....miss you oscar! I'm so happy to see him! Little boys are the best! Our little Israel is simply the best thing to ever happen to me! So cute! I love the simplicity of the card. Great idea to make it a postcard. All around awesome! You have a beautiful boy, Wendy! 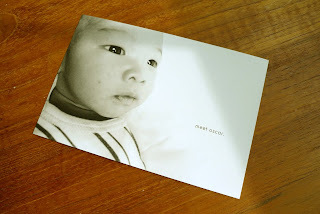 He's such a happy baby :) I love Oscar's birth announcement card you made. Splendid! so funny you mention the favorite outfits... i am doing the same thing! it won't be long till he outgrows everything i love. need to document! Oscar! SO CUTE! You're one blessed woman!